With any endeavor, cultural diversity can help ensure success -- for instance, the Ocean's 11 crew looked to Asia for its contortionist, England for its explosives expert, and Hollywood's dumpsters for its Affleck and Caan. 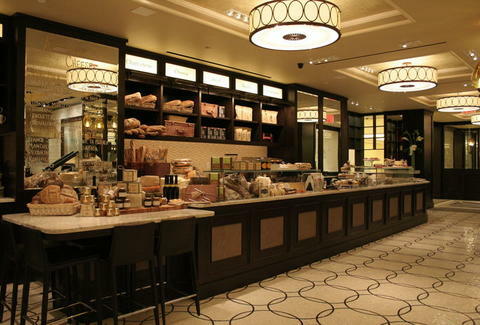 Combing the globe to fill its roster of cuisines: Todd English, at The Plaza Food Hall. Oozing old-school elegance (mosaic tile floors, circular iron light fixtures, scuffed-up mirrors...) meant to evoke the upscale Euro food courts found in places like Harrod's, PFH offers a conglomeration of differently decor'd, counter-top seating outposts, each cooking up a different cuisine but serving the collective output from all the kitchens, a philosophy of sharing that won't be mirrored by you. Stocked with seasonal/local ingredients, America's repped by joints like the Ocean Grill & Oyster Bar, rocking everything from king crab legs, to a brioche lobster roll w/ mustard dressing, to Atlantic salmon w/ grilled leeks, and the more meat-centric Grill, where you'll find mini lamb gyros w/ tahini, spit-roasted organic chicken, and a turkey "PLT" w/ grilled pancetta and whipped avocado (trying to hang out with him is just the pits). Beyond-the-border action: the intimately lit Wine & Tapas Bar (salt cod fritters, grilled chorizo, marinated shrimp spiedini...), the Dumpling Bar (also with varying noodle specialties), and the Sushi Bar, where the days catch is rolled up into jobs like the BBQ eel & tempura shrimp Sea Dragon, and the avocado/bluefin/spicy "Tuna Two Way", who have trouble finding a third party due to their habit of always hitting it raw. Those on the go can pick up finished dishes or individual ingredients from each stand, while others looking to stock their kitchen can hit the market for everything from decanters to kitchen tools, which unlike those of Hollywood can't just rely on their family to get them jobs.